Spring is right around the corner, and with the change in seasons comes the change in wine! Now, I’m not here to tell you what to drink. To all of my fellow winos, I say drink whatever you want, whenever you want to. However, there are certain wines that go better with the weather and with the seasonal events of that time of the year. 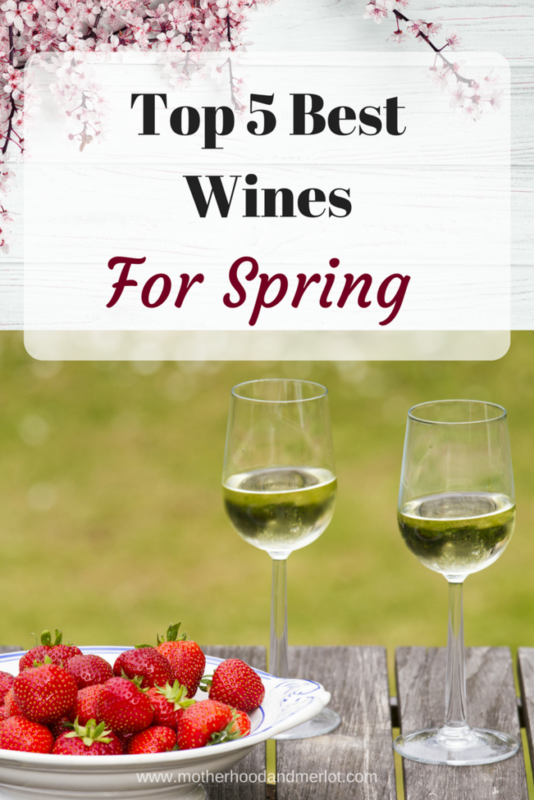 Today, I am sharing a list of the top 5 best wines for spring! You change your diet, your clothing, and your activities with the season, so why shouldn’t you change your wine? It is no coincidence that the wines of fall and winter tend to be more geared towards the heavy flavors, the rich, dry notes, and red wines. Where as the spring and summer months are focused on bright, light, and fresh wines, sometimes with a hint of sweetness. This can be mostly found in white wines, but don’t rule out red wines completely this spring. Prosecco: To me, a sweet and light, bubbly Prosecco screams spring! It isn’t as heavy as a typical champagne, but it is flavorful enough to use in celebrations (spring is bridal shower season:)). Prosecco makes a wonderful cocktail when combined with fresh fruits of spring, like berries, peaches, etc… This would pair perfectly with a meat and cheese plate featuring cheese like gouda and brie, as well as prosciutto and salami. Rosé: For something a little less sweet, but still bubbly, try a light version of Rosé for the spring. These don’t offer quite as much sweetness as Prosecco, but they do still bring on the lightness of spring with the light pink color and the fragrant nose. I would say that this is more of a spring evening beverage. Try this Grand Cadeau Rosé for a great option! This would pair well with a nice spring salad full of mixed greens. Sauvignon Blanc: If anything was a typical “spring wine”, a bright and citrus filled Sauvignon Blanc would be it. This white wine provides delightful flavors of lemon and other citrus notes that are typical of a Sauvignon Blanc. It gives a refreshing flavor to your glass, without being too sweet or too dry as the weather is warming up. I love the Kim Crawford Sauvignon Blanc. A great pairing for this wine would be a light fish dish with a light herb and citrus sauce. Young Pinot Noir: While some Pinot Noir wines can be a little bit on the heavier and richer side, an early Pinot Noir is the perfect companion to a spring day. Imagine being cozied up next to the window, watching the April showers come down in preparation for May blooms. A Pinot Noir full of bright raspberry notes would be heavenly in that moment. Try the Ken Wright Cellars Pinot Noir or the Blue Fin Pinot Noir that can be found at Trader Joes. A good pairing for this with a grilled chicken dish garlic and lime chicken. Pinot Grigio: If it is near the end of spring, and you want to begin to get into the sweeter wines of summer, try a chilled glass of Pinot Grigio. While not as sweet as a Riesling or a Moscato, wines that you typically find on a hot summer day, a Pinot Grigio might bring some fresh, crisp notes of apple and pair to your Easter dinner or spring barbecue. One of my favorites is the Green Fin Pinot Grigio or the Little Black Dress Pinot Grigio for some inexpensive options. Pair this with a crisp apple and fig bruschetta or a fresh salad. What are your favorite wines for the spring season? Would you add any to this list of the best wines for spring? Subscribe below to get notified of more wine reviews and pairings for spring! I love a good rose but I can never seem to find one I like, So maybe I should give that recommended brand a try 🙂 the rest seem to be some of my favorite types, who knew I loved spring wines!? Thanks for the recommendations! Mama loves her wine! Thanks so much for sharing all of these! There are several brands I haven’t tried and I am excited to try them! Yes please to all of these!! Although prosecco is probably my fav! Love these recs! I am going to try that Rose and Pinot Grigio the next time I go to the market. Oh girl, wine is my language! Great round up of all good spring wines! My default is a Riesling but girl I will take a glass of any of these delightful wines! Can’t wait for spring. Cheers! I am new to wine, but I know I like Moscoto so I’m excited to try Prosecco. Do you have a favorite brand? I am horribly predictable when buying wine–I always buy the same brand of cabernet sauvignon. But I know I’m going to like it, so it’s what I always buy. I haven’t found a white wine that I like, but perhaps I’ll step out of my comfort zone and try one of your suggestions. Agreed on all of these, I love a great spring/summer wine on the porch! Cheers! Pinot Grigio is one of my fav wines! I especially like to add a little frozen fruit to it to chill it quickly if it isn’t already! Breyona Sharpnack recently posted…Last baby sadness? I love Rose! I also love a nice Reisling for any season! You are speaking my language! I love Prosecco and Rose! I’m actually picking up a new Rose bottle after work! I am a lover of all kinds of wine. I am so thrilled we are talking about Spring! Rose here I come.. I am not a big wine drinker but these sound great! Mmm I love a sweet white wine in the spring! So fresh! Writing down some of these! I love trying out new wines. The Kim Crawford Sauvignon Blanc is one of my favs! Excellent list of spring wines! I am wholeheartedly in favor of your suggestion of Ken Wright Cellars Pinot Noir. He’s such a master at his craft. I do love rosé, especially with all of the amazing ones that are being produced these days. Cheers to Spring! What a fun post! Prosecco was super popular in Italy and we actually went to prosecco road. It was close to our house and SO beautiful!! I was pregnant tho and couldn’t drink any. Definitely looking forward to moving away from my winter reds and getting to Spring/Summer! I love Prosecco, good choice! I will take one of each.. or maybe two of each! I cannot wait to have a glass of wine again. I love pino noir in the spring and summer! Great picks! I love Proseco and Rose. I’ll have to give some of your suggestions a try! They all sound really delicious! These all sound great, but a glass of Pinot Grigio is just singing spring to me! I am a Prosecco and Rose kinda gal! I’ll have to give those brands a try!